Okay this page was tough. I loved doing the drawing, and then realized that I hadn’t left any space for the words or even considered exactly what I was going to say. I have really enjoyed getting going on this project because it is forcing me to learn as I go and it’s helping me to appreciate what other artists do to create a webcomic. 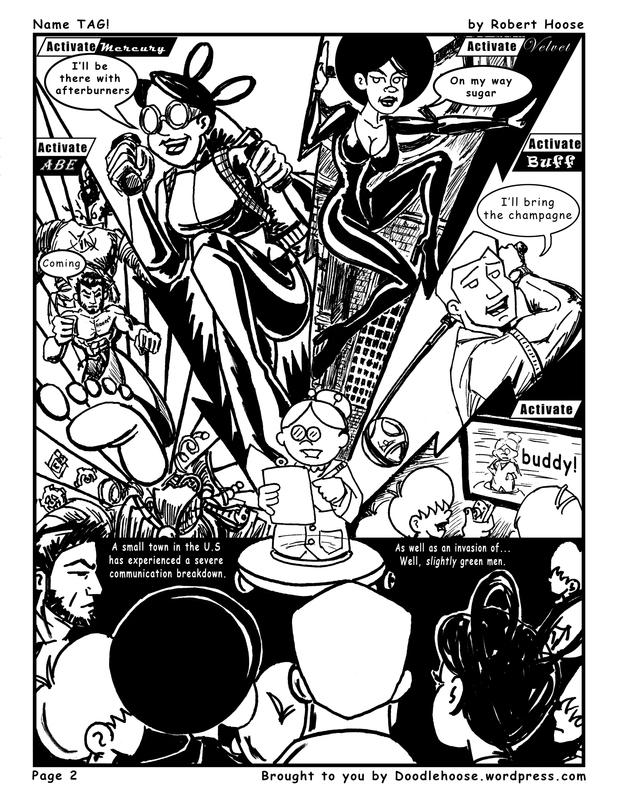 I drew this comic and then scanned it and added all of the words etc in Photoshop. I think that next week I am going to give Illustrator a try. I hope that you are enjoying the adventure and I look forward to the next installment of YURIT. So anyone have tips on lettering or wordbubbling? This entry was posted in TAG and tagged Abe, Babel Chip, Buddy, Buff, Hoose One, Klink, Mercury, Name TAG!, Slightly green men, Small towns with big problems, Velvet. Bookmark the permalink. I think the layout is fantastic and dynamic. Excellently done. I’m not thrilled with the font you used, though, and the spacing is a little distracting. It looks like it was typed rather than spoken. I’ll admit it’s difficult to get lettering just right, but it’s worth the effort because of how much it sets the tone for a comic. I’d encourage you to experiment more. The word bubbles themselves looked fine and were placed well in the panel. Thanks for the great feedback. I’m learning as I go here, and I really am open to critique that helps build. I’m a little intimidated when it comes to hand lettering and still trying to figure out how to get the flow of lettering in the software. I will keep experimenting with it and maybe go back and tweak when I get the hang of it. Do you have any suggestions on how to get that, “spoken” feel? Just thinking about what you went through to create this makes my brain hurt. You’re soooo talented. Thanks for sharing your gift with us–I love the new strip!!! Thanks for the encouragement. My brain hurt as I was doing it. I find that the webcomics I enjoy make the process look simple, but I’m finding more details than I imagined.